Our product range includes a wide range of stylish entrance decorations, indian style entrance decorations and wedding hall entrance decorations. Being pioneers of the industry, we are manufacturing and supplying a wide array of Stylish Entrance Decorations. These products are widely demanded by the clients for their beautiful appearance and designs. The products offered by us are made as per the requirements provided by the clients. 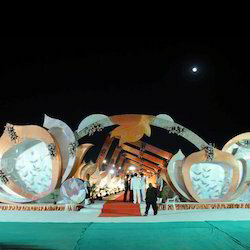 Besides, our products are designed using various flowers, lights and many other things that enhance their looks. 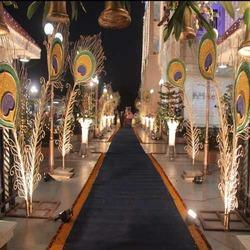 One can avail from us a wide array of Indian Style Entrance Decorations. These products enhance the looks of entrance and able to grab the attention of the clients. Our products are available in various designs and looks and able to reflect traditional and modern appearance. The offered products have gained expertise in the domain, thus we are able to get repetitive order from the clients and assure our clients to deliver these products at reasonable rates. 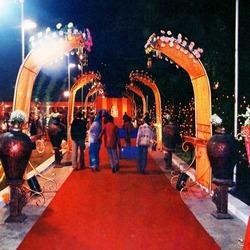 We are providing our clients a range of Wedding Hall Entrance Decorations. Our quality and reliable approach towards services has helped us in attaining the total satisfaction of the customer. The team of professionals works in synchronization with clients to understand their requirement and serve them accordingly. Looking for Wedding Entrance Decorations ?